You know how sometimes you find just the right book when you need it, as if someone dropped it into your hands for a reason? That happened to me recently with not one, but two books that turned out to be related to each other: Grit by Angela Duckworth, and Known by Mark Schaefer. These books entered my life as I was in the final stages of revising and publishing the second edition of Subscription Marketing. During those final weeks, the mass of details can threaten to overwhelm the independently published author. So, a dose of bracing encouragement was welcome. 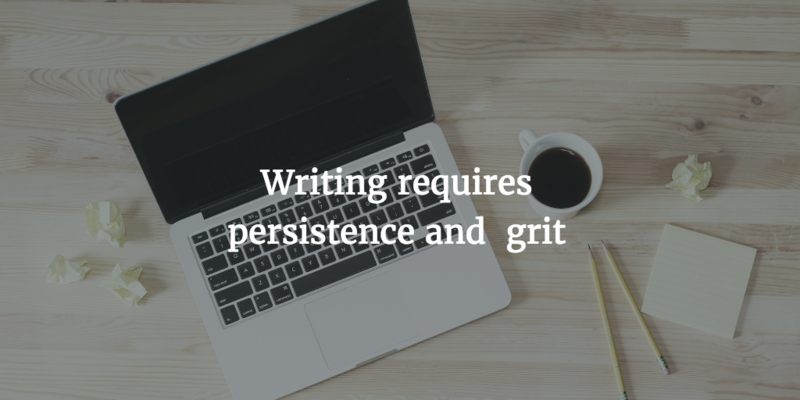 Writing requires persistence and grit. Neither book is targeted directly at writers and authors, but both offer powerful lessons for those who want to write and publish their work. Writers: Read Grit for what it says about perseverance, purpose, and joy in the work. Most of us have a tendency to put a great deal of faith in talent. This belief lets us off the hook when we don’t achieve what we hoped. If we’re not as successful as someone else, they must have more talent, right? Did you notice something? Effort appears twice – and it’s a multiplier. It’s time to get to work. The highest achievers, according to Duckworth, tend to share the same quality, which she calls grit. It’s a combination of passion and perseverance that fuels achievement. The book explains each of these topics in great detail, and I highly recommend it. As you read, consider how these aspects of grit apply to writing. Interest: To achieve something with your craft, you should be interested either in writing itself or your subject – ideally both. Practice: You’ve heard it so many times: to write better, write and revise, then do it some more. You need the capacity to practice and refine your craft. Purpose: A sense of purpose will help you through the tough patches and setbacks. Is there a message you want to share? Do you seek to communicate deeply with others through your writing? A purpose beyond yourself strengthens resilience. Hope: Writing has its good days and bad days. On the bad ones, you need faith that if you keep persevering, you will make progress. Hope gets us through the rough draft, confident that we can fix its imperfections in revision. Hope inspires us to publish our work, so that our message might find others. It keeps us working to build and refine our craft. Hope is also particularly relevant to the work of building an author platform. That brings us to the next book. I’ve been a fan of Mark Schaefer for a while. So I was delighted to find his latest book, Known. As Schaefer defines it, becoming known is about building authority and reputation, not necessarily fame. The subtitle is: The Handbook for Building and Unleashing Your Personal Brand in the Digital Age. Substitute author platform for personal brand in the subtitle, and the you’ll see why I included it in this review. The last step is a doozie — produce, and produce, and produce. Keep listening, improving, and producing. That’s where the idea of grit comes in. Schaefer refers to Duckworth’s book, so they make a great companion set for the writer. Approach the writing and publishing process with a fair measure of grit. If you’re planning on pursuing a writing career and publishing your works, put both of these books on your reading list. Thanks for the inspiration, Mark!